A heaping portion of sweet shrimp. 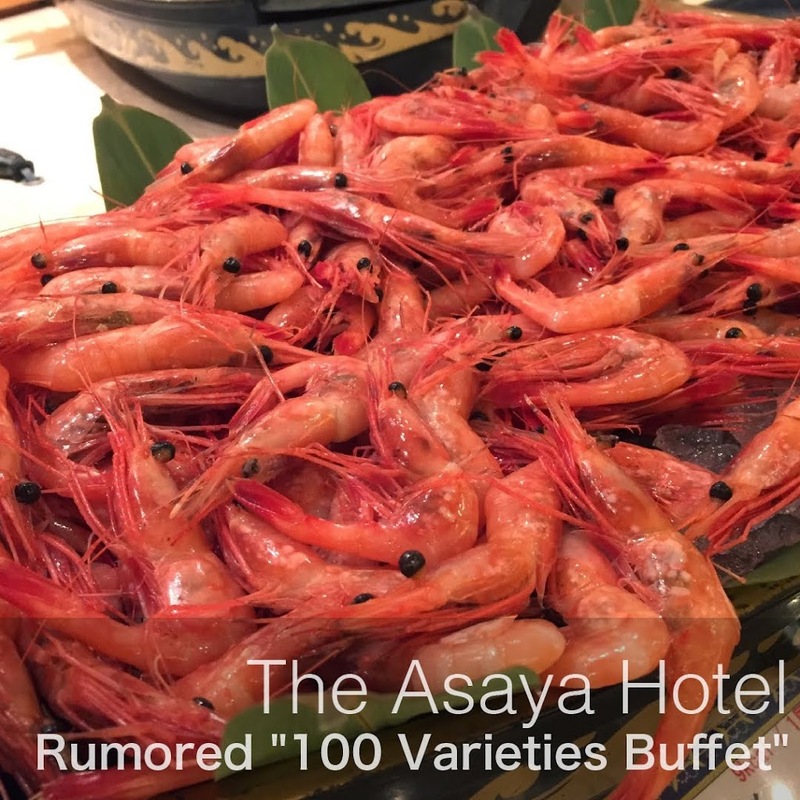 "100 Varieties Buffet" at the Asaya Hotel. A little unfortunate that the room we stayed in smelled of cigarette smoke. You'll definitely want to try the "Asaya Hotel Specialty: Asaya Special Wagyu Beef Curry"
Founded in 1888, the "Asaya Ryokan"
On travel websites, etc., the most popular hotel in the Nikko, Tochigi Prefecture/Kinugawa Hot Spa area is the Asaya Hotel. A little while ago, on a trip that was also to celebrate a birthday in the family, six of us (3 rooms, with 2 people per room) stayed at the Asaya Hotel. After actually staying there, I could really see why the Asaya Hotel is the most popular. When you first enter the Asaya Hotel, you’ll immediately be shocked by the impactful sight. Looking at the front of the Asaya Hotel, the hotel appears to be a short building. However, upon entering, the hotel spreads out beneath your eyes, as a deep atrium appears. It is a sight that will make you think of the bath house “Aburaya” from Hayao Miyazaki’s film, “Spirited Away”. 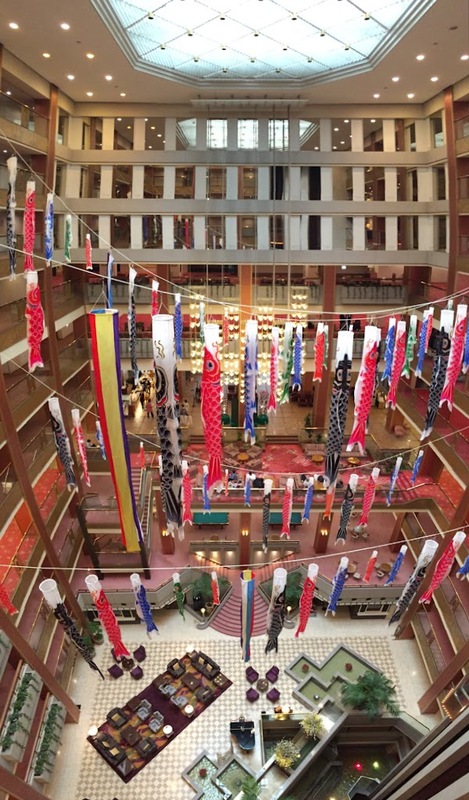 We visited in late April, close to Children’s Day, so at the time the atrium was decorated with carp-shaped streamers. It also feels as though the hotel is spreading out underground, and for a moment it makes you stop and wonder just how the building is structured. When you enter the Asaya Hotel you are on the upper floor, and the atrium appears below your eyes. If you look at the building from the river, it looks like this. Please note that this building is a different hotel than the Asaya Hotel. That being said, I’m really impressed that they were able to build in this place. A hotel building in the town of Kinugawa Hot Spa. Western-style room, in the Asaya Hotel’s Shuhou Hall. This time we stayed in a Western-style room in the Asaya Hotel’s Shuhou Hall. The room was a little on the small side, similar to a twin room at a business hotel. It might be difficult to have an extravagant stay at a luxury hotel in this room. However, since this time we were only staying for a night, and heading off to Edo Wonderland Nikko Edomura the next morning, our stay was short, and the size of the room didn’t bother us too much. Once more, one unfortunate thing about our stay at the Asaya Hotel was the smell of cigarette smoke in our room. We’d requested a non-smoking room in advance, but the stench of cigarettes had soaked into the room. The smell bothered us from the moment we stepped into the room. We turned on the air purifier the room came equipped with full blast, to reduce smell of cigarettes. One thing the Asaya Hotel is famous for is the buffet at the hotel restaurant, Asaya Garden. The buffet has 100 types of dishes. Sukiyaki pots for one person. A heaping portion of strawberries. Rice bowls you make yourself by topping them with your preferred types of sashimi. It even felt like a form of culinary entertainment, as dishes came out, one after another, just like they did in the banquet scene of Movie “Spirited Away”. Dishes made with the Nikko specialty "Yu-Ba"
Also, it’s not just that it comes with a 100 different varieties of dishes, another wonderful thing about the buffet at the Asaya Hotel is that there is no time limit. At buffets with a time limit, “eating” becomes the main focus, but it is wonderful to be able to take your time and eat without rushing. Note that, with 100 different dishes, it’s quite easy to get full, so, if you’re planning on conquering all one hundred types, I recommend taking just a little bit of each one. The next morning, we had the breakfast buffet at "Dining Wasaikobo". While I don't think there were one hundred breakfast dishes like there had been for dinner, the buffet had a fulfilling amount of content. They also had unique options, like original sandwiches that you craft yourself. Apparently, another specialty of the Asaya Hotel is the “Asaya Special Wagyu Beef Curry”. A deliciousness created by over 30 types of spices, and the delicious taste of Japanese Black beef. states, a delicious curry. I feel like I could eat this curry on a regular basis. The “Asaya Special Wagyu Beef Curry” was served not only at the dinner buffet, but at breakfast time as well. Also, even if you don’t stay at the Asaya Hotel, you can enjoy the “Asaya Special Wagyu Beef Curry” if you go to the hotel restaurant for lunch. Furthermore, they sell the curry as a souvenir at the souvenir shop as well. I think that this “Asaya Special Wagyu Beef Curry” is a dish that you will definitely want to try while at the Asaya Hotel. The Asaya Hotel is located in a place called “Kinugawa Hot Spa”, and the location is famous for its hot springs. Within the Asaya Hotel, there is a large hot spring pubic bath as well. Up until now, I’ve experienced places such as the the Nyuto Hot Spa, surrounded by snow, and roadside hot springs on the coast. 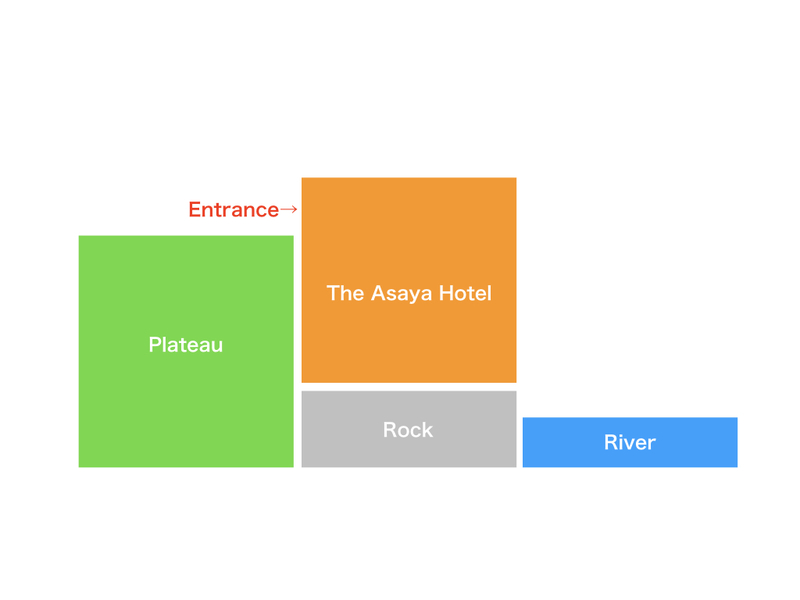 Compared to these places, the hot springs at the Asaya Hotel was a common type of hot springs facility, and I don’t think that there was anything bad about it. Please note that, at the time of my visit, the “Sky Garden Open-Air Hot Springs” that the Asaya Hotel is so proud of was undergoing renovations. They have a table tennis area at the Asaya Hotel and guests are free to use it. There are around two table tennis tables set up in an area like a conference hall, and, I believe, that you reserve them for use. There is also an arcade game machines close to the table tennis area. This area somehow feels like the Showa era, traditional Japan period. If you look up the Asaya Hotel's history, there are some deeply emotional happenings, such as the hotel being swallowed up by the wave of the times. During the Meiji period, the hotel was first opened under the name the "Asaya Ryokan", serving as a hot springs ryokan (Japanese-style inn) for the Kinugawa Hot Spa town. The "Shuhou Hall" was built using bank loans in the bubble period of the 1990s. 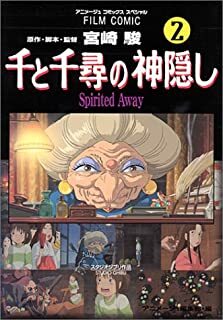 "Shuhou Hall" is the "Spirited Away" place with the atrium that I was talking about before. I thought, the reason that things like the golden interior design and so on had somehow made me think of that era, is because it was the architecture of that time. However, the bubble collapsed, the bank that was financing them failed, and the management situation of the Asaya Hotel. In 2004, it was decided that the hotel would receive support from the Industrial Revitalization Organization, and debts to the bank, etc. were forgiven. Through various methods of organizing operations, such as dismantling decrepit buildings, and reducing the number of rooms, the Asaya Hotel was reborn. 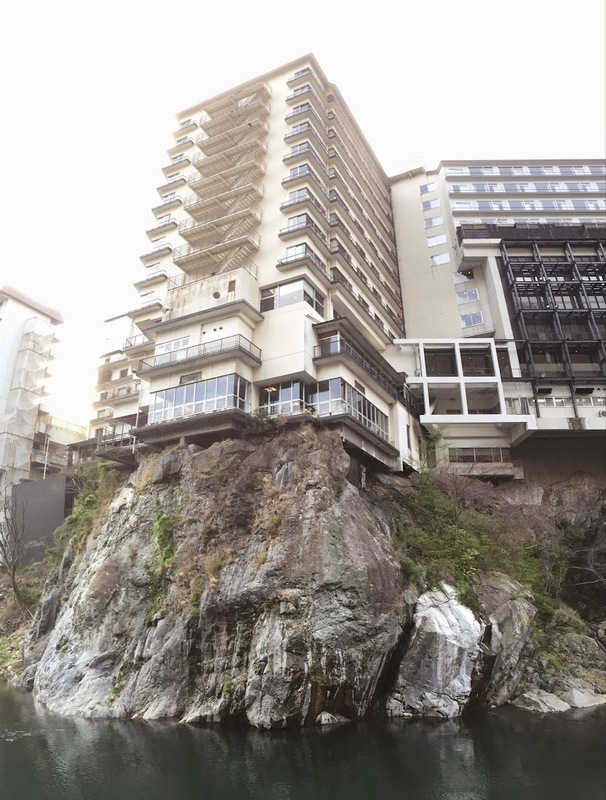 As a result, the Asaya Hotel is currently the most popular hotel in Kinugawa Hot Springs. Staying at the Asaya Hotel I somehow felt as though they were actively undertaking policies etc., to please the tourists. Overall it was very satisfying. In various places throughout the hotel, I could feel the effort being made to increase the guests’ level of satisfaction. The building of the Asaya Hotel does feel old, but it appears as though maintenance is being conducted appropriately and, save for the “soaked in smell of cigarettes” I mentioned before, nothing really bothered be during my stay. The quality of each dish included in the “100 Varieties Buffet”, which could be called the Asaya Hotel’s specialty, was high, and it was also quite enjoyable as culinary entertainment. However, rather than for “a relaxing time in a rustic hot springs inn”, I feel this hotel is best utilized for a loud and rambunctious stay with a large group. The Asaya Hotel is located in the township of Kinugawa Onsen (Kinugawa Hot Spa), a hot springs town located along the Kinugawa River. In Japanese, the name of the river, "Kinugawa", is written using characters meaning "demon", "angry", and "river", and feels a little ostentatious. I imagined that, long ago, the river would overflow due to flooding, and that it owed its name to this feeling of having "angered" the "demon". The river's name used to be written using characters meaning "clothing", and "silken". The name "Kinugawa" owes its origins to the powerful Ki Clan of the area. and is the result of linguistic corruption of the words "ki no kawa" or "River of the Ki". According to one theory, the current characters used to write the river's name ("angry" and "demon") came in to use from the year 1876. It would appear as though demons didn't play too much of a role in it. If you want to stay at Kinugawa Hot Spa, Check this search.